In a city that loves to celebrate, I've given careful thought to Easter this year. How is it that for me, the celebration of Easter has dwindled down to a weekend of Good Friday and Easter Sunday? To collecting Easter goodies for the boy's baskets and finding a place in town for an egg hunt? In my heart and mind, I want Easter to be a big deal. I want our boys to have a visual in the house that it's Easter. I want to spend days reflecting on the death and resurrection of Jesus Christ. I want to talk more openly with my friends about the greatest moment in history - the resurrection. 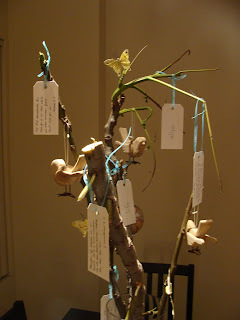 I was encouraged recently from Ann's thoughts at www.aholyexperience.com as she shares about their family's passion tree, Lent, and the devotions she reads before Easter. 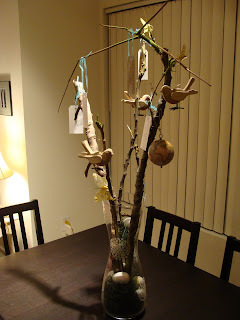 In a small step to establish traditions for our family for this glorious day, we made our own Easter tree. I don't consider myself creative, but find it satisfying to copy a great idea when I hear or see one. For us, tree limbs are rare in the city...at least to take! It just so happened on our way to Michaels for supplies, a worker was trimming the trees out on our sidewalk. I was able to get the trimmings that fell to the warm concrete. Our 'new beginnings' decorations consist of wiry butterflies and wooden birds. A globe ornament that symbolizes all are loved and included in God's plan for redemption. As my friends, whether you are a Christian or a seeker, may we have more of a fresh look at Easter this year because Christ's death and resurrection offers us hope and forgiveness and peace and life. May this not just be another holiday or another celebration. May it be the holiday and the celebration of the year.